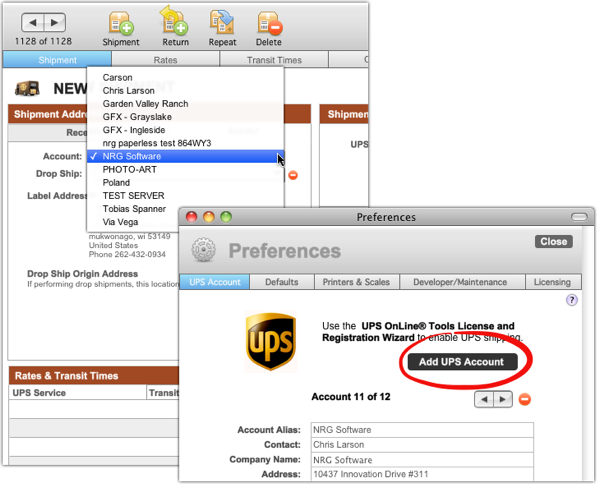 NRG: Mac & FileMaker Shipping Software :: Does NRG's UPS Shipping Software support multiple UPS accounts? NRGship UPS Pro and UPS for FileMaker support multiple UPS accounts. You can specify a "default" account for new shipments in the Preferences menu. You can add additional UPS accounts in the Accounts tab under Preferences and choose which account you'd like to use under the Sender tab on the main screen.